Re-live the days of thunder as you power your way to pole position for a place on the podium. Hand brake turns and total burn-out's are unlikely to happen in these hand built rugged ro adsters, but the ability to build a 'Porsche eater' from a plank and four pram wheels might just give you the edge. Spanners, Screws, Wheels and Deals! 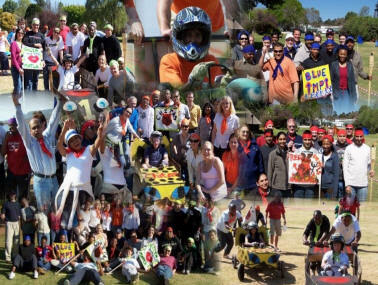 'The PUSH CART DERBY' is a fantastic, fun filled outdoor event, designed to get teams working together and thinking through a project. Once your crazy creation has been built and customised to your liking, its time to test your vehicle where it really matters – in the PUSH CART Derby Team Trials! Your team will compete against the other vehicles in a series of four craftily wrought tests, each involving a different set of skills.